This qualification is aimed at those wishing to pursue a career in the health and fitness industry as a fitness instructor in the context of gym-based exercise. Courses are delivered by our experienced tutors, who are practical and hands-on in their approach. Training will take pace in our Academy of Sport. You'll study the science of the human body, as well the practical techniques and skills required to become a qualified fitness instructor. You'll study the heart and circulatory system, the respiratory system, structure and function of the skeleton, musculoskeletal system, postural and core stability and the nervous and energy systems and their relation to exercise. You'll learn about the safeguarding of children and vulnerable adults. You'll develop an understanding of the health benefits of physical activity and the importance of healthy eating. 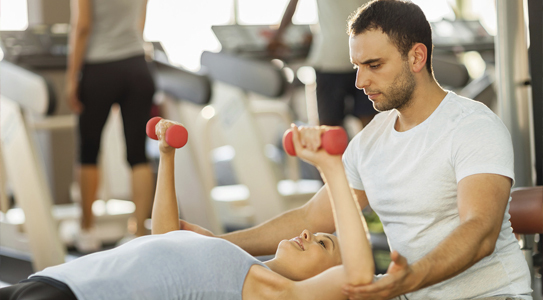 You'll develop the skills and knowledge required to plan a gym-based exercise programme for both individuals and groups. Client groups also covered are older adults, ante and postnatal clients and disabled clients provided the relevant key safety guidelines are observed. All units are assessed by multiple choice theory paper/eAssessment, practical examinations and worksheets. New course dates to be confirmed, please contact the Academy of Sport for further information. Courses are normally £550 per person.